I love pillows because they are the ultimate accessory. Not only can you swap them out seasonally to change a room but they can usually be found at a very reasonable price so you don't feel like you're tied to pillows like you are with a couch or chair. 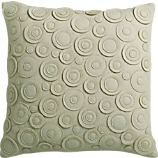 The other great fact about pillows is that they ALWAYS go on sale (eventually). 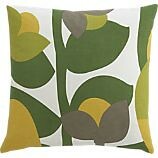 I saw these cute, modern pillows in the last Crate & Barrel catalog that came to the house and I think they're so fun. It feels good to think about spring and swapping out the winter colors for something lighter and brighter.